There must be lots of others like myself, who have no literary pretensions, yet who enjoy and respond to poetry. Not always, in my case, for I have to confess I feel out of my depth with some kinds of modern verse. I have the temerity to try to express my appreciation of Yvonne’s poems only because they have a quality that speaks to my heart and mind. Most of them are evocative and moving, while others bring a smile of recognition of their purport. All invite the reader to go along with the flow of memories in which the poet recaptures, with restraint, the felt experience of a particular event or time. When our friendship first blossomed over 60 years ago, I knew Yvonne as an accomplished pianist. The gift was clearly in her fingers and her sensitive interpretation of classical music. It was only much later that the poetic impulse which must surely have been gestating within her for years, emerged to reveal this other unsuspected, latent talent so evident in her first published book, “A Divisive Inheritance,.” that was received with immediate acclaim by reviewers and readers alike..
Now, as I turn the pages of her second book of poems published quite some time after the first, I feel that the promise shown there is more than fulfilled in this volume. Since, to some extent, we have a shared past, I feel an instant response within me to some of the memories and images she conjures us. If there is a single theme that dominates Yvonne’s work, it is the recurring emotion that thoughts of home (Sri Lanka), bring to the fore despite her having lived half her life in distant climes. The pull of her Motherland is clearly seen, yet without cloying sentimentality or paeans of praise to its scenic beauty. “Gone Away” is one of these. There is a touch of humour as when she recalls the tiresomeness of her brothers “monopolising the aural sensibilities with cricket scores from outer space” drove her to the fruit trees in the garden. “dressed to look like little Lord Fauntleroy. their heads brushed `cuckoo’ with curls”. “eddies and currents of the friendliest of waterfalls ran like deranged satyrs do….”. 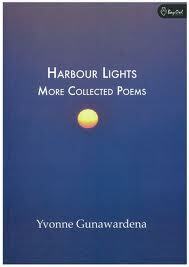 The poem, “Harbour Lights”, written in 2010 after an evening on the terrace of the Mount Lavinia Hotel, gain captures her heart’s preoccupation with the country of her birth. on the state’s monolithic visage”. Another piece that spoke to my heart was “Anil’s Garden”, a spontaneous response to a friend’s garden in Cambridge where, again, the felicity of her words instantly conjures up the essence of its appeal. wring out of my narrowing tunnel vision.